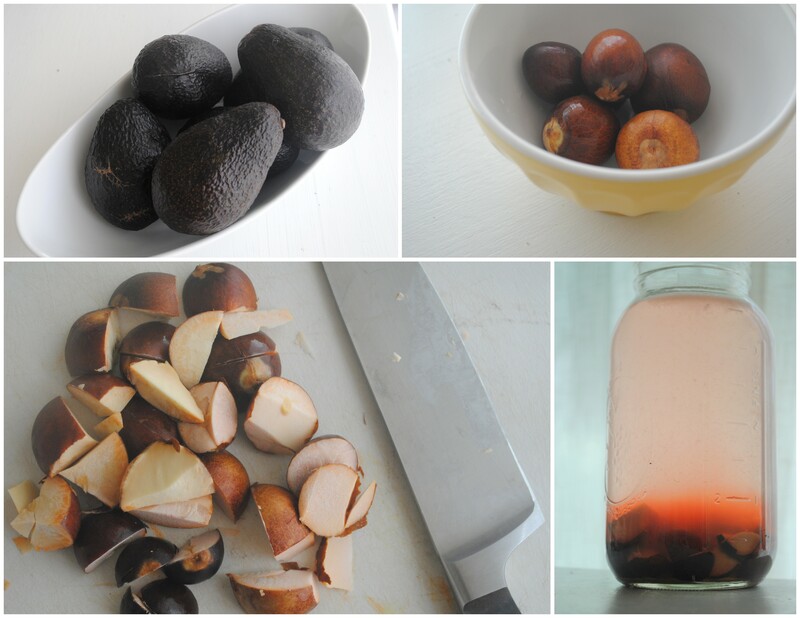 Last month, a good friend sent a late-night email asking me if I’d tried using avocado pits for a natural dye. Whoa there – Avocados make a dye? Yep, apparently, they do. I immediately started an online search and discovered that both the pits and the skins can be used for natural dyes. 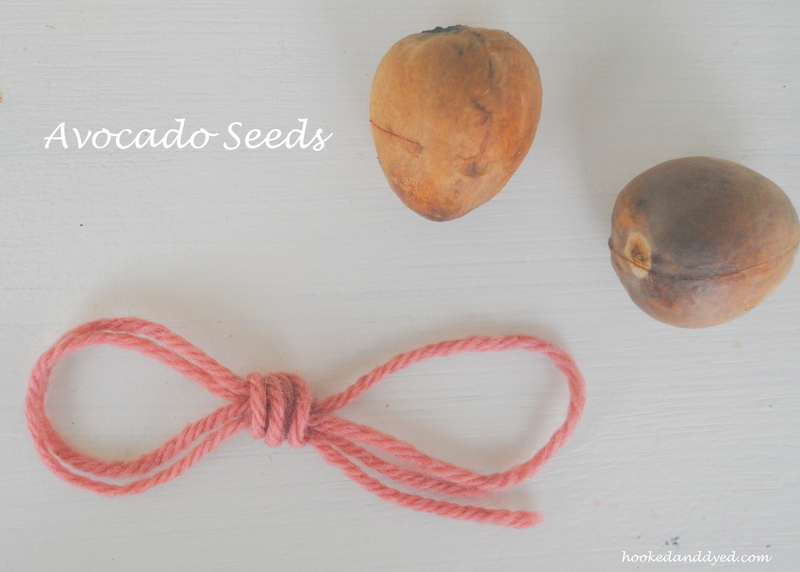 The seeds (pits) make a rosy pink, the skins make orange. Some dyers commented that coaxing the pink out of the seeds was a long process and not worth the resulting pale shade. I kept that in mind, but most of my recent experiments produced yellow or orange. I craved a new color. I needed to make pink. I learned a few basic concepts repeated from various dyers and chose to use them as my foundation for experiment number one. The dye needs to have a high pH, which means it needs an additive such as ammonia (I used washing soda), and you’ll need to buy pH strips to test your dye. The highest I achieved was 9. Heating it, reheating it, and reheating it again will deepen the color of the dye. This is perfect as a solar dye. I chopping my pits, added them to a large mason jar, added hot water, and ½ teaspoon of washing soda (pH turned 9). My plan was to let the dye sit in the sun for a few days before adding my yarn. Within an hour, the dye turned the color of the top photo. My jaw hit the floor. Who knew? Once a day I’d heat the dye on the stove, simmer it for at least 30 min, while continually checking the pH. When it lowered, I’d just add a bit more washing soda. The dye color deepened after each heating. It spent the rest of the day basking outside in the sun. I continued this process for a week before I added alum pre-mordanted 100% wool yarn. I simmered it again for another 30 minutes, monitored the pH, and took it off the stove to sit in the dye overnight. My second experiment included the same dye bath, but with an additional five pits. I repeated the same heating process as the first experiment, then added this skein of alum pre-mordanted wool (it was a gift, so I’m not sure if it’s 100% wool.) After letting it simmer on the stove for 40 minutes, I poured the dye back into my jar, and let it sit in the sun for another 10 days. The colors are in the range that I saw online – pale, rosy pink. But the color of the dye was so rich, I’m curious to see if it’s possible to intensify the results on the wool. Next up – avocado skins! Hi. I did try to dye cotton fabric with avocado skin and pits. I obtained an old fashioned pink, very cute. The only thing I did was collect skin & pits, dry them in the sun, then put everything in the pot once I had enough in quantity. Boiled for about 45 mins without adding anything. Left to cool overnight, filtered the dye, added alum premordanted cotton fabric, simmer for 45 mins, left to cool overnight. removed fabric, rinsed until the water turned clear. I will try to experiment skin and pits separately next time and add soda ash like you did. Thank you for sharing your experiences. Thanks for sharing Sophie! That’s interesting you didn’t use an additive, used both pits and skin, yet you still created pink. Perhaps I added several unnecessary steps? I’m intrigued – I’ll need to keep experimenting. Hi. It could be the vartiety of avocados that make the difference too. I live in New Caledonia and we do not have hass avocados but several other varieties. Different shapes, skins that stay green when ripe, very thin skin. I used a mix of them in my experiment. But true, when I cut the pits in pieces, once in contact with air, from cream color they turn orange. Cheers. Good point Sophie. I noticed that my pits went from cream to pink around the edges after contact with air. I think I’ll try the pits and skins together next time to see what happens. I made a ferment using a large number of very old, very dry pits soaking in water and 1/4 cup of ammonia. 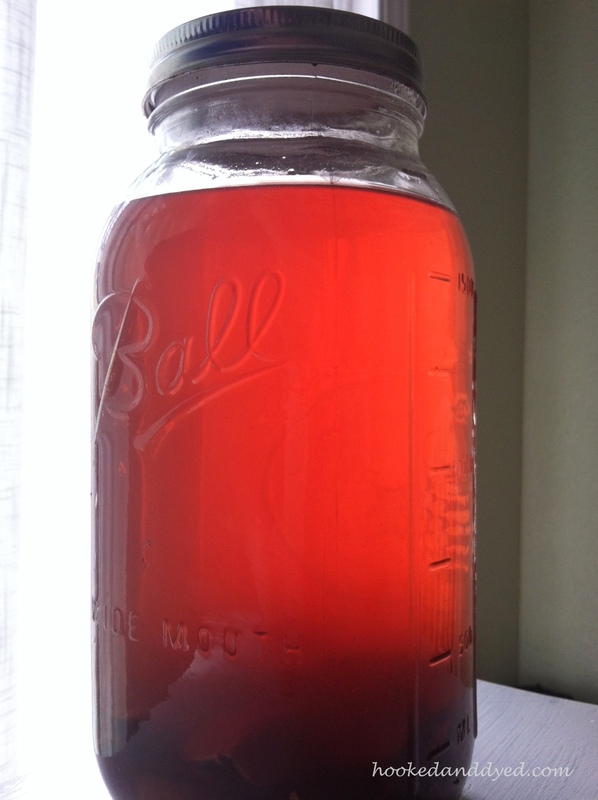 The color of the dye liquor was really promising–a sort of dark magenta color that was almost completely opaque. However, my results have been somewhat disappointing: first I did a sort of amended solar dye, soaking 100% alpaca yarn in the ferment for three weeks on a sheltered part of my porch, then I used the still very dark dye liquor to do a stove-top dye with 100% wool roving. In both cases, the color was a sort of pale eraser color: kind of pinkish, but closer to beige. I’m not sure what happened, but I’m working through possible explanations in a post I’ll put up on our blog in a couple of days. Your results have inspired me to try again, however! I’m so pleased that I’ve inspired you. I have a jar of pits that’s been in the sun for almost a month now just waiting for me to try this dye again. Two thoughts: did you mordant you fiber with alum? And did you check the pH of the dye? I’ve noticed that the pH will change after it’s been in the sun for a few days. I look forward to reading your post! Woot! What a pretty pink. I’d been collecting pits and peels, but unfortunately they didn’t make the move (I maybe forgot to put them back in the freezer…oops). Your results have me itching to try again. Can’t wait to give this a try! Really pretty pink 🙂 Great tips- I’m going to start collecting pits. Used one avacado stone quartered and rinsed skins in dyebpot. Simmered 30 min. Added one dry 1 oz handspun white alpaca, simmered another 30 min. Let it all cool down and rinsed skein. 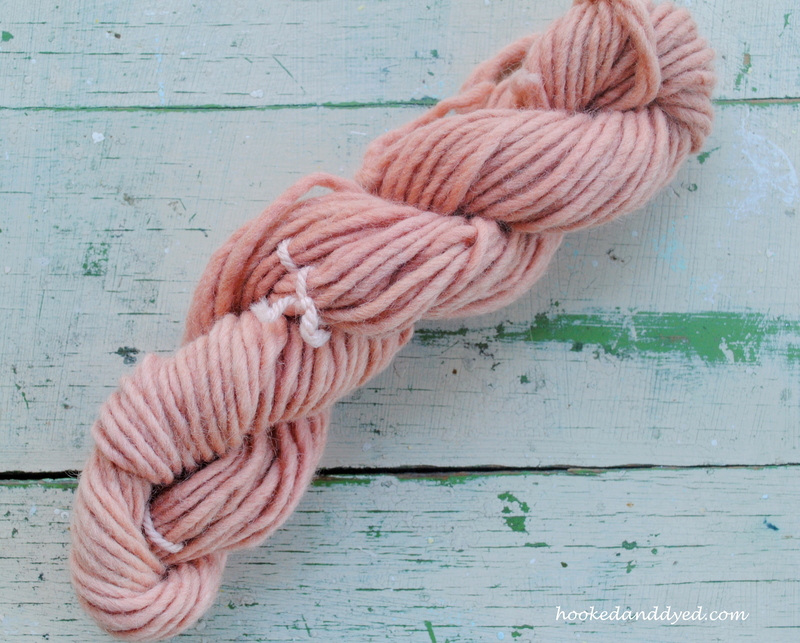 1 fresh avacado stone and skin produced enough dye to do at least 2 to 4 ounces of wool a stunning soft pink. Colorfast? We shall see. I have enjoyed reading all your experiments! Does anyone know if the avocado dye is fugitive, and if so, how fugitive? Fair, or good? I am a beginning dyer in New Mexico, and have had great success with chamisa–it is so strong! S. Gail, I am also in NM and want to try chamisa. Do you use the whole plant or just the flowers? It’s in bloom now. Does anyone know the difference in the dye color yielded from the chopped frozen pit compared to the dried and chopped pit? Also what about using the dry Avacado skins separately? Is there a difference in dye color when you use ammonia versus soda ash when making the dye liquor? I put avocado pits with skin of one avocado with ammonia put in the sun the color turned a; beautiful orange/red. I decided to put in a 2oz skein of yarn I had dyed with Dahlias dried – put in the sun – for 2 days the color is a beautiful orange. Also top-dyeing grey yarn dyed with Dahlias. I forgot to mentioned that I used alum for a mordant. If you don’t like the color of a yellow you have dyed this is a great bath to put in. Thank you Liz C.
So inspiring. I have a big bag of skins and pits I have been collecting for months. I have always loved the skins and pits and wished I could make something with them….now I can!! I am a new follower and totally absorbed with your precise and thorough experiments. Can you tell me what “washing soda” is? That is not a term i’ve heard here in Canada. We have bicarbonate or baking soda or laundry soap for washing clothes.???? Great question. Washing soda is a sodium carbonate. It’s used for washing clothes, cleaning, ect. I bought my box at Target, so it should be easy to find. Some people also use ammonia to make a dye more alkaline.